Although I'm definitely a sun junkie, my favourite time of year to get outdoors and indulge in a little friluftsliv is during the last quarter of the year. From October to December, the crisp air, drifting fog and contrast of warm & cool colours make the perfect conditions for slow strolls with the dog. I've been searching for a while for the perfect jumper to wear during my winter walks. Something warm, well-fitted and (most importantly) not itchy. When the very generous folk at TOAST offered to send me a piece from their current collection, I was immediately drawn to the Shetland Fair Isle Pullover. 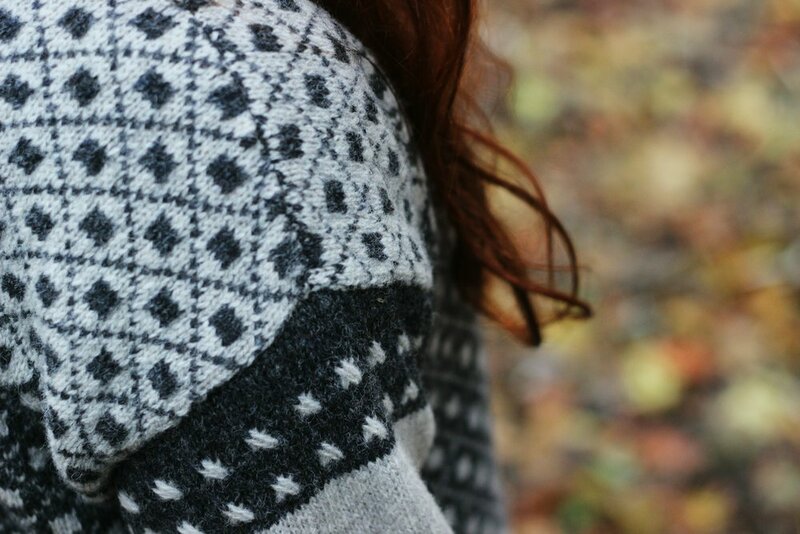 This cosy, Nordic-inspired woolen jumper is everything that I wanted and more. With the weather a little balmier than average at the moment I've been wearing it on it's own with a pair of jeans over a long sleeved top; it's warmth allowing me to forgo a coat for the time being. Strolling through the woods, fallen leaves crunching underfoot, I feel suitably snug. The great thing about this jumper is its versatility. I've been wearing it with skinny jeans for now, but secretly admiring how Toast style it on their website with a mid-length linen skirt and chunky shoes. I can see myself throwing it on in summer over one of my own billowing skirts or a pair of denim shorts - the perfect cover-up for around the campfire. There's a gorgeous linen jumpsuit waiting for me under the Christmas tree that I know I'll be able to slip the jumper over, and it even looks cute slung over my little pinafore dresses. The styling opportunities are endless! The photos here were taken on a walk through the local woods in early December. The air was crisp and chilly, but the jumper kept me nice and snug, even when we paused to take these snaps.